The 4 hour BDI course is available in the classroom on certain nights and certain weekends or online. If you need it NOW or in a hurry,you can also come to our STUART office and take the class privately getting your certificate ON THE SPOT the same day. Call us at 772-220-0510 to set up an appointment for your PRIVATE on the spot BDI class. All BDI class will allow you to remove points from your license and may lower your insurance. After you complete the Point Reduction class online or live, we can electronically send your completion certificate to the Drivers License Office. You will receive a certificate as well, which you should copy & mail to the Clerk of Courts in the county in which you received your ticket. The private class is more expensive $85 than the normal class $43 pre-paid or $48 the day of class.however it is done when YOU want to do it. The last 4 digits of your social security number and a valid ID are required to process your certificate. COME TO THIS CLASS unlimited times after you pay once...This classroom only course will be an extensive review of the questions you need to know before you attempt to take the 50 question and sign LEARNERS PERMIT TEST. This will help whether you go live to the Drivers License Office or attempt the test online. DON'T Fail like 70% of the people who tried before you...Go in and you may ACE that test! ** Drug/Alcohol 4 hr class 1st step to get a permit. This is a State Required (FL STATUE 322.095) class that all people must take to get a Learner's Permit in the state of Florida. You must be 14 years old to attend this class, live or take it online. No Certificates are issued anymore. We are linked with Drivers License Office & we can send the certification electronically! This course is a 4-hour class that is offered live or online. Classroom sessions are conducted on weeknights and weekends. This class allows the student to get their Learner’s Permit and eventually obtain their license. We have the Florida Drivers Handbook, which can be picked up at your class (or you may download a copy below). Upon finishing the class, we can electronically send your completion confirmation to the Drivers License Offices in all 67 counties in the state of Florida. This package is designed for teens and allows them to learn to drive in a progressive but controlled environment. Insurance discount certificates are presented upon completion of The Full Package program. Each student will receive 30 hours of classroom instruction combined with 6 hours of one-on-one, behind the wheel training with an instructor who is currently teaching in the public school system. 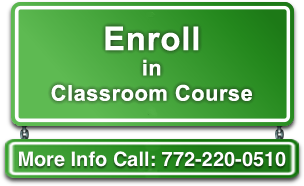 The classroom portion of your professional driving instruction is broken into four classroom sessions; it is a requirement that you attend all four classes. Classes are labeled A, B, C and D. Classes may be taken in any order, however all four classes and the workbook follow up portion must be completed before an insurance discount certificate can be issued to you.